Toilet problems getting you down? If you are like most people, unclogging your first toilet is somewhat of an informal rite of passage; this is especially true for new homeowners who are burdened with the responsibility of tackling their own DIY repairs. If blocked drains were the only toilet problem we had to deal with, life would be much simpler. However, since we live in the real world, there are many more significant issues you may want to be aware of when it comes to this common household plumbing fixture. At Brothers, we treat everything from malfunctioning flappers to faulty fill valves to broken handles and more. It should be noted that all of these parts are interdependent on one another to ensuring your toilet fills and flushes as it should. This means neglect of any individual component can inevitably lead to increased wear and tear on the others. You might be wondering what kinds of problems can arise from a damaged toilet. For starters, you can say hello to higher water bills. If your toilet’s flapper refuses to fully close, an issue that can commonly happen as a result of a warped or damaged rubber seal, the tank will never stop trying to fill to the designated water level. There is nothing worse than listening to the sound of a toilet constantly running, and for those who understand the gravity of the situation, the noise is equivalent to dollar bills going down the drain. Cracked bowls and bases are additional problems commonly associated with aging toilets. Water leaks are the imminent result, and they can quickly turn from bad to worse if you are not careful. Imagine waking up to a flooded bathroom floor. Now imagine the ensuing costs that come with cleaning up said leak. In all instances related to toilet repair, it’s better to be safe than sorry. Thanks to our around the clock emergency plumbing service, Brothers can fix your toilet woes at even the most inopportune of times. Since the only thing waiting around will do is waste more of your water, hard earned money, and cause a whole bunch of headaches, our crew is bound and determined to settle the score in record time. Before dispatching to your home or office, one of our on-call technicians will stock their work truck with every tool and spare part they may need. This ensures they will not need to return to the shop, effectively reducing the cost to you, the customer. 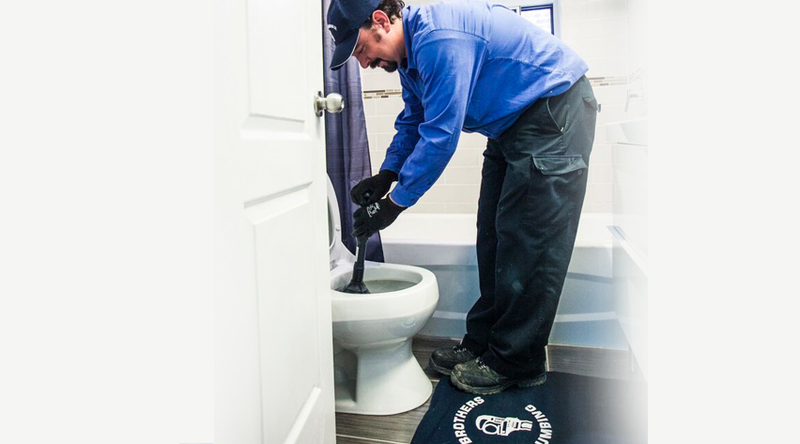 All Brothers’ team members are certified to work on every type and brand of toilet available; whether yours is a retro model that has been around for three decades, or a brand new, low flow model, we guarantee our team can fix it! To learn more about the toilet services we offer and/or to set up a service appointment with one of our crew, do not hesitate to call or email.